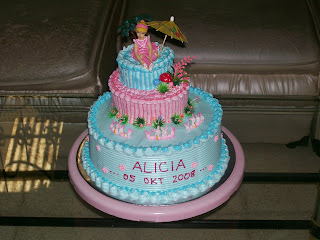 This is the birthday's cake of my daughter Alicia. The colour is so sweet for me, it can make my heart calm and relax. The same with Alicia's dress. I enjoy it very much, sweet blue! Thank you my sister for making and preparing the sweet birthday's cake for my daughter.